According to The Guardian in 2012, Hallmark tracked the number of cards given in the United States and not surprisingly, Mother's Day is the third most popular card-giving day after Christmas and Valentine's Day. Following behind in fourth place is Father's Day, and isn't that reflective of where fathers often fall in the pecking order of attention in our society? Yes, mothers are usually children's primary caregivers, but fathers are also important contributors to child rearing and caregiving, yet they are sometimes overlooked in certain areas of child welfare policy, one of which is adoption. As our cover story points out, in contrast to the literature on adoptive mothers and birth/original mothers, remarkably little attention is paid in the adoption literature to the issues and needs of birth/original fathers or adoptive fathers. According to cover story author Deborah Siegel, PhD, LICSW, DCSW, ACSW, "Each of the many different routes to adoptive fatherhood brings different clinical and practical issues that birth and adoptive fathers, policy makers, and clinicians must be aware of so they can be appropriately addressed. These routes affect both the biological and the adoptive dad." 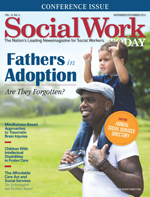 Furthermore, Siegel proposes that social work's commitment to promoting social justice, celebrating diversity, ending oppression, and enhancing functional family connections calls for the profession to support birth and adoptive fathers as both men play important roles in the lives of the adopted person and his or her extended family formed by adoption. We hope that all fathers—indeed, all families by birth, adoption, or choice—enjoy the special connections that often happen at this time of year, and for those who are lonely and isolated at this time, that a social worker is there for support.